On September 6, 2017, Interscope and Universal delivered two mixes of “You’re The Best Thing About Me” to radio. One is labeled “Album Version” and the other mix is labeled the “Sci-Fi Soul Mix”. Both songs were delivered to radio in both Europe and the USA. The lyrics are slightly rearranged in the two mixes, and they have very different instrumentals. 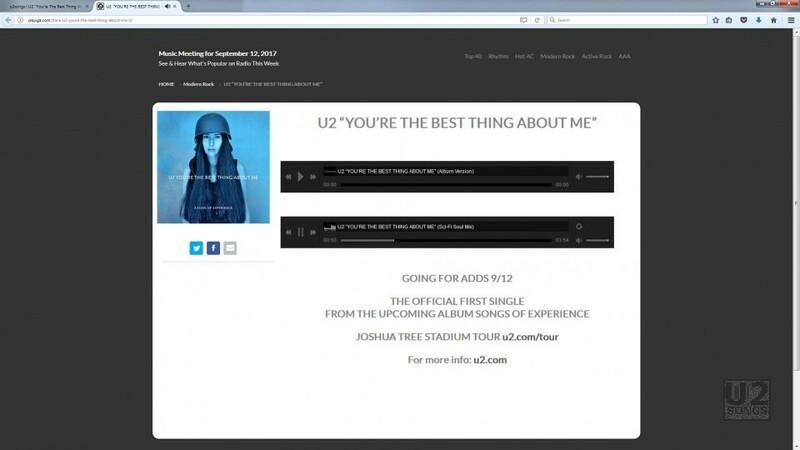 Both tracks were also made available to stream at http://playiga.com/track/u2-youre-the-best-thing-about-me-2/ – this is an Interscope promotional site for radio, and the site includes links to share the track via email, facebook and twitter. Users have reported that the site is now no longer loading, however others are saying that with some patience the site will load up. Producer: Jacknife Lee, Steve Lillywhite, Ryan Tedder. Engineered by Rich Rich, Jacknife Lee, Tyler Spry, Matty Green, Matt Bishop. Recording Engineering: Duncan Stewart, Richard Rainey, Greg Clooney, Christopher Henry, Alan Kelly, Gosha Usov. Assistant Recording Engineer: Barry McCready. Mixed by Kelana Halim, Tom Elmhirst, Steve Lillywhite. Assistant Mixer: Brandon Bost. Additional keyboards by Jacknife Lee. Additional programming: Ryan Tedder, Brent Kutzle, Jacknife Lee. Strings: Davide Rossi. Mixed by Jacknife Lee. Producer: Jacknife Lee, Steve Lillywhite, Ryan Tedder.